Pie crust has a bad reputation. People think it’s tricky and time-consuming to make. Unwieldy, difficult, and not all that good for you. Not true! Pie crust is exceedingly simple to make, and it doesn’t take much time at all. It’s not difficult to work with, and when it’s cooked it generally looks good no matter how much you mangle it. In fact, pie crust is one of those things that thrives on neglect. The less you mess with it, the better it tastes. Here’s a recipe for basic pie crust. Flour, salt, butter, and ice water. Simple! Also called short crust or pate brisee, this pastry is extremely versatile and can be used for just about any of your pie crust needs. The trick is to keep it quick and keep it cool. As a general rule, it’s recommended that you use a 2/1 flour to fat ratio. Personally, I use less fat, more flour, and make up the difference with water. I use butter. You can use margarine or any other vegetable fat, though, either with or instead of the butter. 2 tricks for keeping it light and flaky. First – you freeze the butter. I stick a bar of butter in the freezer, and then wait an hour or two to use it. Second – grate the butter, and then stir it in with a fork, trying to keep it as piece-y as possible. Grate the butter into it, stopping every now and again to mix in what you’ve just added. If you wait to the end it will all clump up again. I stir with a big fork. 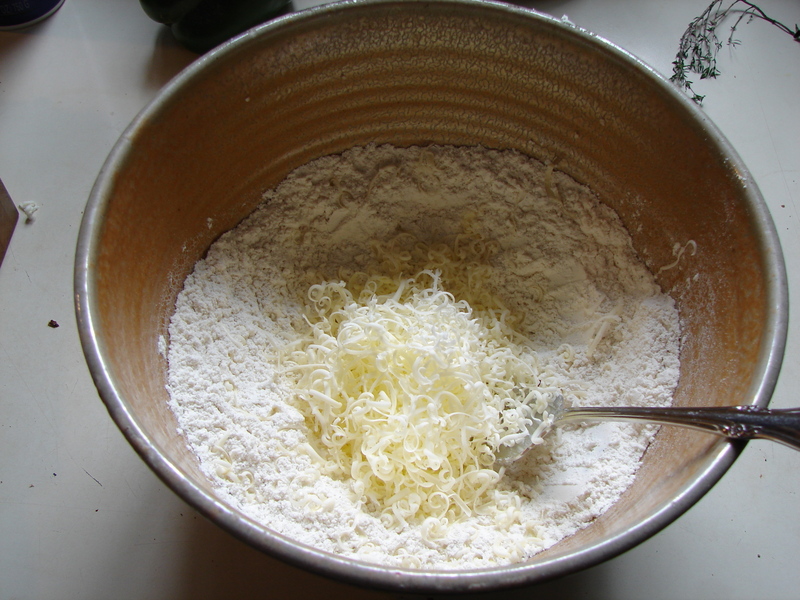 When it resembles bread crumbs, and all the butter seems to have coated itself with some flour, add about 1/2 cup of ice water. Stir again with the fork. At this point you’ll have to use your fingers, but use the tips, and keep them cool. (and clean!) Pull it together into a ball, kneading a tiny bit to incorporate all of the ingredients. (you might need to add more water). Wrap the ball in foil or plastic wrap, and put it in the fridge until you’re ready to use it. That easy! This entry was posted in crust, recipe and tagged butter, pate brisee, pie crust, recipe, shortcrust by Claire. Bookmark the permalink. So how long do you bake it? At what temp? Is this for a pie with just the bottom crust or the bottom and top crust? It depends on what you’re making! And how big it is. this is adaptable to different recipes. If I was using this for a ten-inch tart, say, I’d cook it at 425 F for about 5 – 10 minutes (till it loses its shine and starts to look firmish). Then I’d fill it and cook until the filling was done (depending on what the filling is!). For a double crusted pie, I wouldn’t pre-bake. It would be smaller in diameter, but I’d still cook at 425 f. times vary depending on the filling, but usually till it’s golden and crispy.